Only one question left over from last week, which I missed due to being sick. Make sure to leave me some more questions in the comments for next week! Just one last question on using CF screw in type light bulbs - on the packaging, they give two wattage ratings, the actual usage and the equivalent incandescent wattage. Which one do I refer to? I don't want so much wattage in my little 29G tank that I have uncontrollable algae blooms! This is confusing and is really misleading. The actual usage is the one you are interested in. You can basically throw out the "incandescent equivalent" numbers because they are meaningless. For a 29 gallon tank, I'd stick with between 60 and 100 watts of light (2-3 watts per gallon). 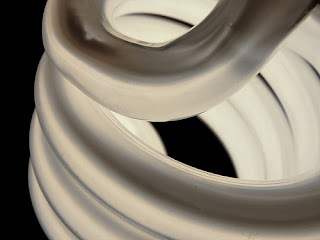 Screw in CFL bulbs are not quite as efficient as long CLF bulbs, so take the wattage numbers with a grain of salt. They also create quite a bit of heat at higher wattages so be sure they are well ventilated. Excessive heat will shorten the bulb life. I was thinking of setting up a planted tank for Spotted headstanders. How could I help prevent them eating the plants, and what plants should I use? I want to create a jungle which is good looking and can grow back as fast as a Heasstander could eat it. I would generally agree with the author for the amount of florescent light. I have a 130 watt florescent fixture specially designed for my 29 gallon tank. Very bright tank, new fish are very unhappy for weeks until they 'get their tan' and are used the the much brighter light then they grew up with. Plants that LOVE that extra light, such as amazon swords and glossostigma will absolutely grow like crazy with good fertilization & CO2 injection with this much light. I lost one of the 2 bulbs (don't let cats jump on tank and knock light fixture into tank) and on just 65 watts, the amazon swords need to be pruned every other month rather then weekly and the glosso is all gone now. With 130 watts of light, I had no chance of growing a lot of low-light plants such as crypts and such. They just won't stand for all that light. My fish and snails will snack heavily on the sick & weak leaves, but leave good strong healthy plants alone. I don't know about these headstanders, but a healthy amazon sword plant is quite tough and none of my smallish fish can touch it. Those are some great recommendations. But I would have to say that the wattage per tank size all depends on the species of plants you want to keep.